Rimini - Capital of seaside tourism since the beginning of the last century, Rimini is easily reachable from any part of the globe. Palacongressi di Rimini 3-6 May 2020 - Venue for the Symposium, the Palacongressi di Rimini, is one of the largest and most innovative conference centres in Italy; it is a unoque venue for its architectural quality and its technological features. Designed and built according to eco-friendly concepts, it is also the first Wellness Congress Location in Italy ever. The leading trade fair for professionals operates in the fruit and vegetable sector in Italy and Europe. 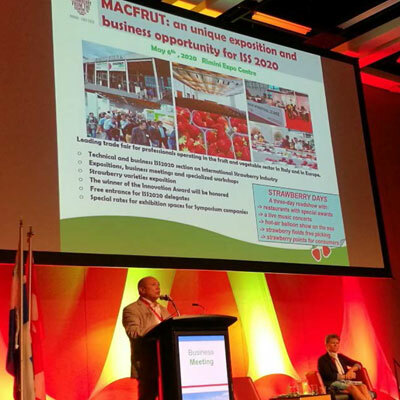 The link with MACFRUT helps to organize business sections that promote concrete exchanges with the industry, following the approach science-to field-to consumer. The participation to the strawberry industry will be promoted by giving space to expositions, business meetings and specialized workshops. Innovation Awards will be delicated to companies that have strongly contributed to innovation in the strawberry sector.